Whether you’re a coffee drinker or tea drinker, there’s one thing everyone can agree on: The mug you use to drink your beverage of choice is just as important as the brand you like, the amount of milk and sugar you take, and your favorite biscuits to go with your drink. 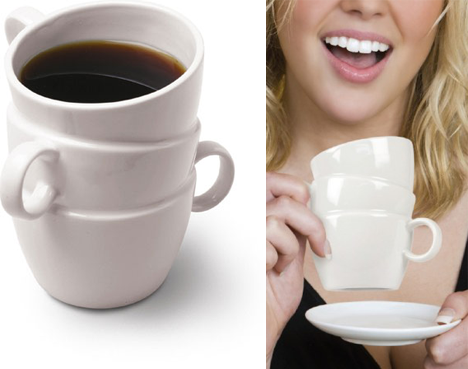 To take you away from the boredom of everyday mugs, and to provide some additional options for the newly addicted, here’s a collection of mugs that are unique and practical at the same time. This mug is useful on so many levels. Whether you have just started drinking coffee and need a guide to help you try different versions before you pick one, or you’re just not that good at measuring ratios and don’t want to bring out the measuring cups every time you make coffee, this mug is there to help you. This mug also makes a great gift for someone else because after all, it’s not just a mug, it’s a guarantee that you’ll never get their coffee wrong again. 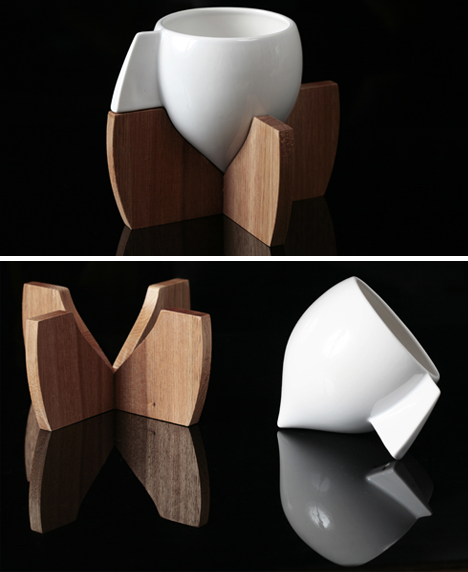 The concept behind the Skase teacup set is as beautiful as the resulting product. Watson describes his creation as based on the idea of symbiosis, i.e., just because two different elements have had a prolonged association, that doesn’t mean they necessarily benefit each other. Applying that concept to the relationship between a (flat-based) teacup and a saucer, Watson has removed both the flat base and the saucer while giving the cup a unique design without taking away the balance and stability. Drinking coffee or tea should never be a hassle. Who wants to bother with saucers and plates, laying out biscuits, and so on? 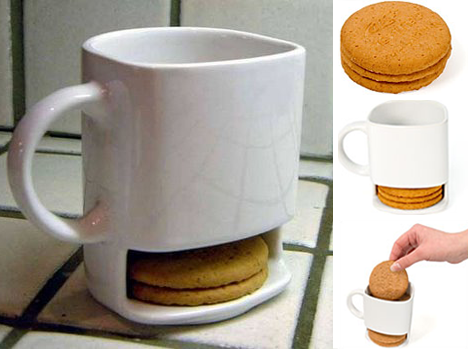 With this dunk mug, you dont have to worry. No more handling extra saucers or dealing with boxes of biscotti, or even extra washing. The idea is so clever, and though not revolutionary, so utterly simple and useful that you have to wonder, why didn’t anyone think of it before? The concept for these cups isn’t entirely new. Take something disposable, redo it in something reusable and voila you have a coffee cup that also serves as a pop art conversation piece. 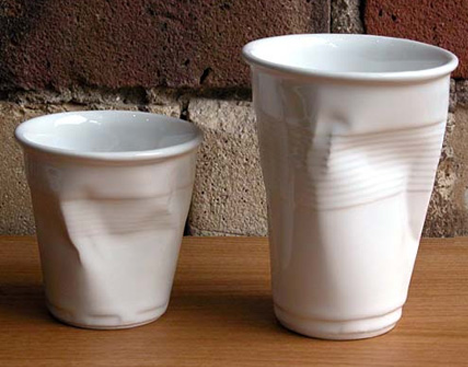 However, the crinkle cups concept from Robert Brandt is not only one of the designs that started this trend, but to this day remains one of the best realization of the concept. First introduced in 1975, the cups are still popular both for drinking water, wine, and espressos, but are also equally popular for making a statement about our disposable culture. 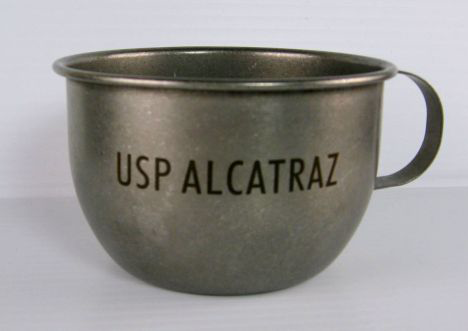 These tin cups were used in prisoners’ cells and dining halls for the simple reasons that they are both durable, and unlike ceramic cups (which can be broken and made into weapons), these are largely safe for a closed environment containing large numbers of people with violent tendencies. If you like this replica mug, you should also check out our collection of ‘jail hotels‘ where as the name suggests, you pay to be in prison! The self-stirring coffee mug really is awesome. All you do is pour in the coffee, add the cream and sugar, and press a button. Voila! Now need for a spoon or a stirring stick, the mug does the job for you, which also means less washing for you. 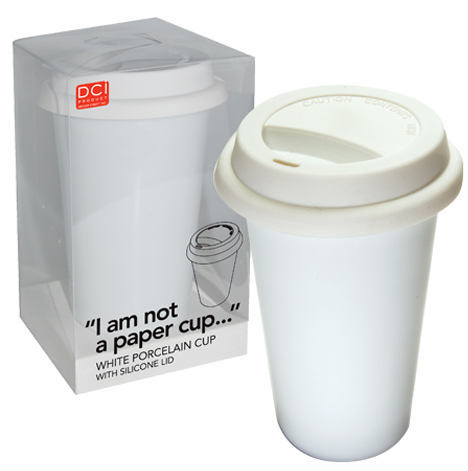 ‘I am not a paper cup, I promise!’ says this mug, but on the surface, it’s hard to believe. However, if you look deeper, you’ll see that this mug, made with two layers of porcelain that keeps your coffee warm and your hands protected from the hot beverage, and a silicone cap that is flexible and reusable, is really quite fantastic. Not only that, but you can also make the difference, environmentally, with all the paper cups, plastic caps, and cup holders you’re going avoid. Love your triple espresso but don’t want to keep refilling? This stack of three coffee mug is just the thing you need. The mug holds 8 oz. and is just the kind of thing that will get the conversation going and help your high tea stand out from the others. Many people can’t really get their day going until they’ve had their morning cup of coffee. Why not drink that morning power-up from a mug that is both cool to observe, and thought-provoking at the same time? As you pour the hot coffee into the mug, you can see exactly what the world will look like if we continue to abuse our planet and the polar ice caps melt. Check it out in action! 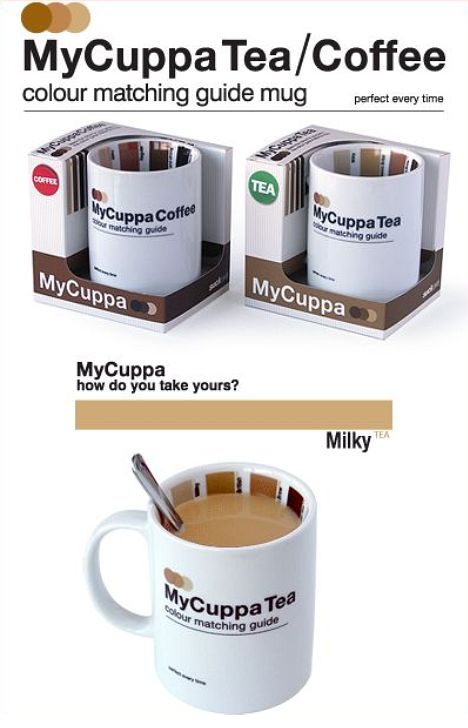 This mug, covered with heat sensitive pigment, changes from black to white (or vice versa) depending on whether it’s full or not, and how full it is. 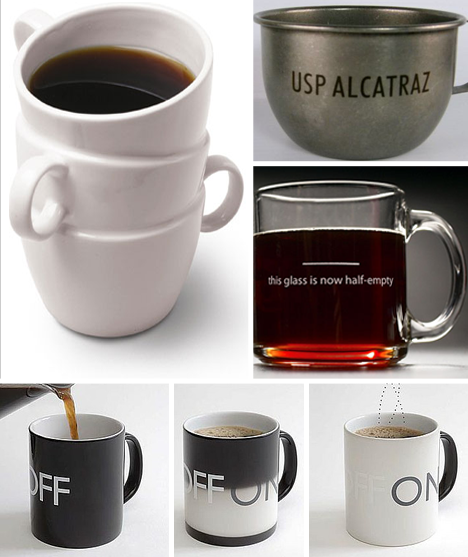 Furthermore, it also shows ‘on’ or ‘off’ as you fill it, or gulp the coffee/tea down. This, of course, comes in handy in preventing spills as you can tell which mugs on the table are full and which are empty. However, since the pigment is activated by heat, don’t expect it to work at room temperature. The pessimist’s mug can be used as a reminder to yourself to stay optimistic, or given as a gag gift to your favorite Debbie Downer. Whether you use it as a joke or for personal development, the mug can be powerful in its otherwise humorous message.